Australian researchers caught up in avalanche last year building a cultural museum to boost tourism. Conserving culture: The site of the museum in Kyanjin near where prayer flags mark a memorial for each person who died in the 2015 earthquake avalanche. Emma Waterton and Hayley Saul from Western Sydney University were in Langtang last year researching its archaeology, heritage and development when the 25 April earthquake set off a massive avalanche that buried the village. At least 200 people were killed, 70 of them tourists trekking along the scenic valley in the Langtang National Park. 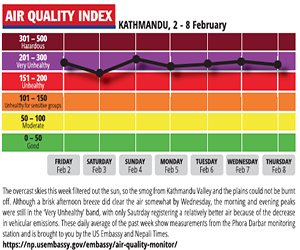 Surviving villagers were rescued by helicopter and spent months at the Yellow Monastery in Kathmandu. “We had just finished our research in the village and were half way through our trek. There were so many reasons why we should have died,” Saul said, recalling the horror of watching the cliff face opposite them peel away and fall into the river below. When Waterton, 34, and Saul, 38, trekked to Langtang five years ago, they knew nothing about it. 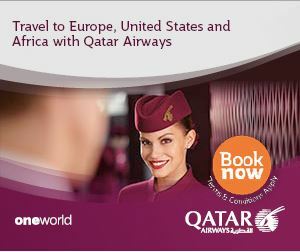 Last year they were helping write its history when they narrowly escaped the disaster. This week, Saul and Waterton were visiting the village for the first time since the tragedy. It was a silent descent as they arrived in Kyanjin Gompa by helicopter. They were greeted with khadas and a quiet exchange filled with emotion. “I think about it a lot more than I normally would so I was very nervous going back,” Waterton reflected. Villagers gather in the community centre to see the draft plan for the museum. Temba lama, head of Reconstruction and Management in the Himalaya saved the two Australian academics from the landslide last year. “They both have very good hearts so it was very emotional seeing them. I’m happy that they’re here, but it reminds me of everyone who is not,” he said. Since the earthquake, research objectives have shifted with plans to use the data collected to make a commemorative Sacred valley of Langtang Museum. With funding from Western Sydney University, an exhibition will extend outside to various locations attached to stories and histories of the people in the village. “It is much better than us presenting our research in literary form. It will be more special coming from the words of the people,” Waterton said. 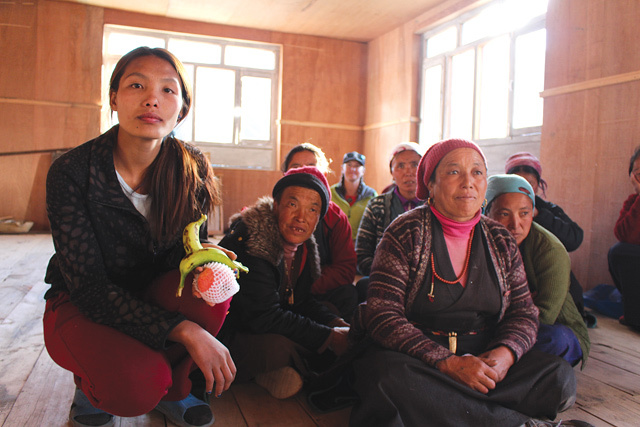 Indebted to the people of Langtang, Saul and Waterton have started a Langtang Survivors Fund which has raised over Rs 7,000,000. The earthquake struck just before noon on 25 April, shaking off a large chunk of Mt Langtang Lirung (7,227m) which fell on a glacier and swept the debris to the valley below. The shock wave that preceded the avalanche blew away the village, and most of the bodies were found on the other side of the river. 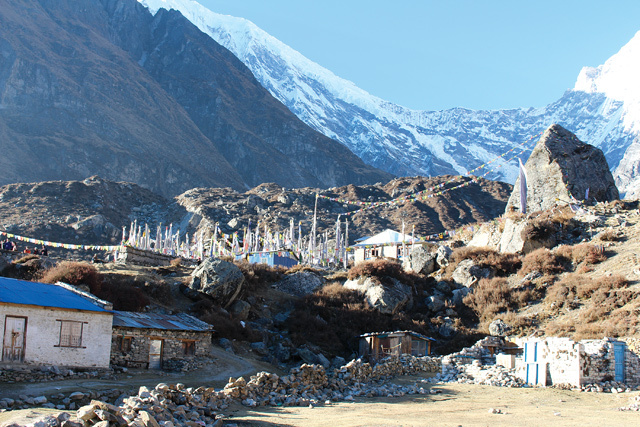 Langtang village still lies buried under 100m of rock. It is hoped that the museum will not only be a reminder of the cultural history of Langtang, but will bring tourists back to the village. Even though the Langtang Trail has been repaired, there has been a 50 percent drop in the number of trekkers since the earthquake. Australian researchers Hayley Saul and Emma Waterton visited Langtang this week for the first time since the earthquake. The project will be a big step in the redevelopment of the village. Wind and hydro technology has been incorporated in the design and will make the outdoor exhibition multi-modal and interactive. “In the long term this will be what we leave behind and what the younger generations will learn about us. If the design is successful, we will look at using these technologies for other things like generating electricity in the village,” Lama said. Locals are currently finalising museum plans presented to them by the Vice-Chancellor of Western Sydney University this week when he visited the Valley. Locals hope that the museum will attract more visitors and encourage them to stay extra days here. “It’s a debt that we have as a university to the people of the valley of Langtang,” said Kevin Dunn, Dean of the School of Social Sciences And Psychology of Western Sydney University. The museum is projected to be completed in April 2017 to commemorate the two-year anniversary of the earthquake. 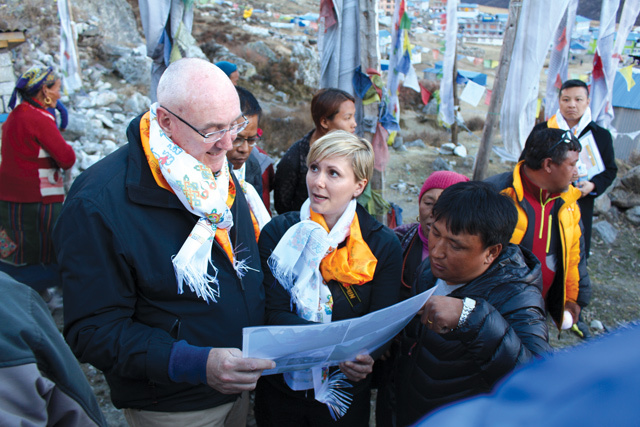 During their visit to Kyanjin Gompa, Vice- Chancellor of Western Sydney University, Barney Glover presented a scholarship for a student from Langtang to study a Bachelor of Tourism Management in 2017 in Australia. WSU academics also attended the convocation ceremony at Kathmandu University where a Mobility Agreement was signed to enable ease of overseas exchange between the two institutions.